Layer the bottom of the glass with yogurt. Add a layer of granola, another layer of yogurt, and top that off with an additional layer of granola. 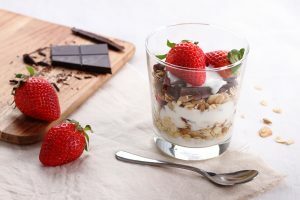 Top with pieces of chocolate and sliced strawberries.